Barrie, Ontario, July 9 2018, (www.linkgreen.ca) LinkGreen has expanded their online ordering solution to include an online order desk accessible directly from a wholesale suppliers website. This expansion allows wholesale suppliers to offer their customers a fully branded and seamless online ordering experience from their website. This feature offers customers convenient access to their supplier wholesale online catalog with their pricing, order history and contact information for their assigned sale rep. It includes all the benefits of a custom online ordering solution without the upfront and maintenance costs associated with custom-built technology. “This new feature allows wholesale suppliers the ability to brand the online order desk for each customer, offering a truly personalized and exceptional ordering experience. The ability to give each customer or buying group an ordering experience based on their product needs adds an unparalleled value,” commented Warren Patterson, CEO of LinkGreen. 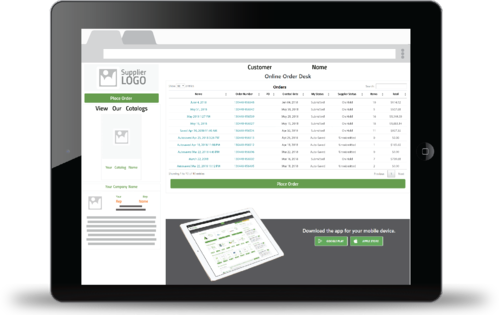 LinkGreen’s online order desk also takes full advantage of all the operational and sales benefits LinkGreen has to offer. The order desk feature is a part of LinkGreen’s strategy to provide a superior ordering experience to wholesale buyers and higher value to wholesale suppliers through online ordering.